While Provo has a big student population, we also have a giant family population, student or not. 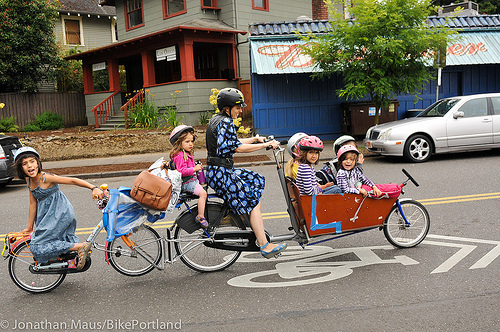 I know many families who integrate bicycles into their day to day routine. There is Heidi in Orem who bikes around with her vintage, and vintage inspired, town bikes who’s boys ride fixed, mountain, and BMX, there is Aaron in Provo who bought both of his boys new bikes last year with the agreement that they would ride to school every day, there is Nick and Betsy who recreationally pedal their twins around in a Chariot trailer, and scores of others out their every day going to the park, to the grocery store, or up the Provo River Trail. I myself ride my four year old around on our Xtracycle, or in the Box Bike I made, to get groceries, see friends, or whatever needs to be done. It seems however that once a family passes the two kid mark they start to decrease their biking, and as numbers of family members grow that biking almost disappears. Seeing that we are in a family oriented place and the fact that BikeProvo loves biking as both a way of life, and as a way to make our great city even better, I could not look past this incredible article on BikePortland about a mom who does not own a car, and bikes her SIX kids around town. Emily Finch is her name, and biking with kids is her game. No she does not have a DUI, and yes she is choosing to pedal instead of drive (she replaced her SUV with her Bakfiets). The Finch’s show that no matter the size of the family you can still ride around town to run errands, and go on outings. Is it always a party on the bike? No, it definitely is not, but is it always a party in the car? I have noticed that my little one actually does better when we are biking around because she gets to see everything, and we are able to talk about what is going on around us. The article is chock full of wonderful anecdotes from the Finch families bicycle adventures my favorite of which involves a screaming kid and a bungee cord. Most importantly the article shows what can be done even if you do not live in some bicycling mecca like Portland (the Finch’s started biking while still living in Pennsylvania). Next time you need to grab groceries, or run to a family event remember Emily, and think about taking bikes (check this article we did a while back to get you going). You can follow the Finch’s adventures through Twitter @1lessgmsuburban. This entry was posted in Kids and Family Cycling, Women Cyclists by Zac. Bookmark the permalink.